image credit: Leslie Friedman, Dime, 2014. Main Line Art Center is proud to present the work of a selection of Professional Artist Members in our award-winning galleries. Juried by esteemed artist James Sherman Brantley, internationally recognized contemporary artist and Philadelphia native, the exhibition features painters, photographers, sculptors, and mixed media artists from the Greater Philadelphia area. 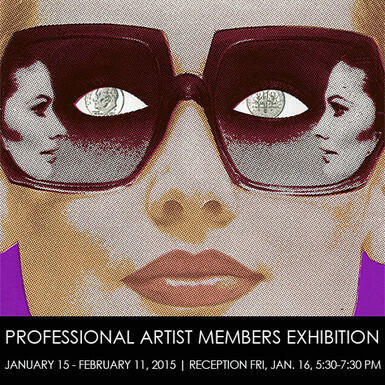 The Professional Artist Membership Program provides a select group of artists with a variety of exhibition, educational, and networking opportunities that enrich and support the artists as well as expose them to collectors, curators, and designers. The exhibition, includes a variety of media and styles, opens with a reception on Friday, January 16 from 5:30 – 7:30 pm. **Note: The application for this exhibition is now closed, but to access important drop off dates and other details, you can access the prospectus here.